I was wondering if you could draw and ink your comics with Apple Pencil in Procreate on the iPad Pro. 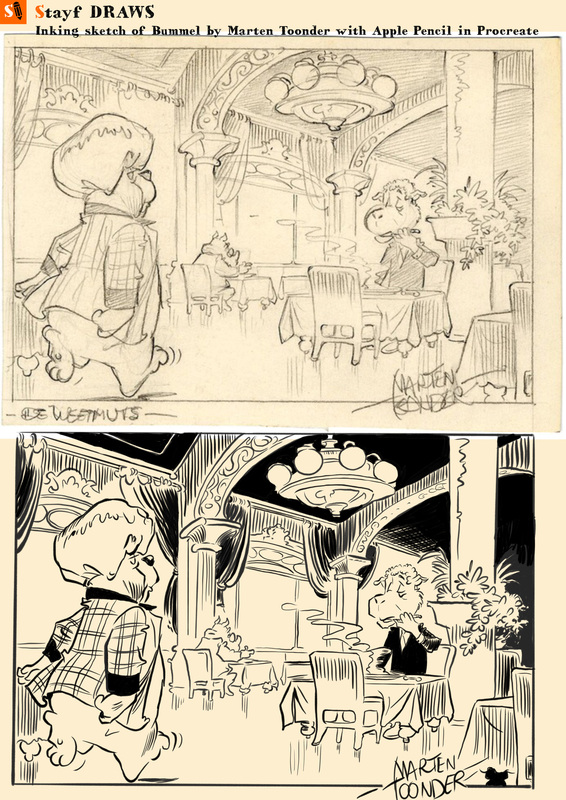 So I did an ink test on one of my favorite comics Pogo, by Walt Kelly. It took a Sunday page and imported it into Procreate on a canvas of 7.000 pixels by 5.000 at 132 Dpi. This resembles an A2 poster at 300 Dpi. 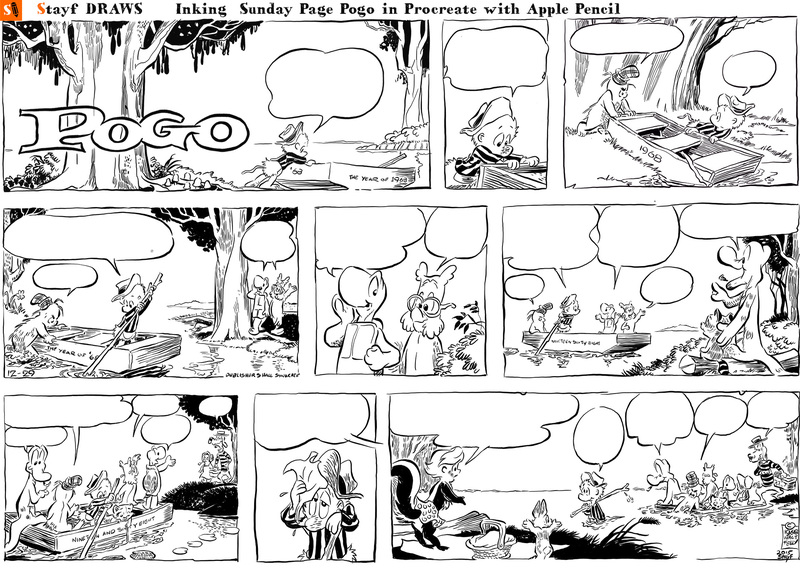 I chose to do a Sunday Page of Pogo because of the versatile inks of Walt Kelly. There is a broad spectrum of thick and thin lines in the characters and a more subtle inking in the backgrounds of the panels. From the Procreate forum I downloaded a great inking brush, because you can make your own brushes in Procreate and share them through Dropbox. It is great to ink with the Apple Pencil I left the brush size and Opacity at 100 %. So I only controlled the inking with the pressure sensitivity of the Apple Pencil. You have much more control over your stylus than a Wacom Stylus. I wanted to do just one panel to see how it worked, but I got the hang of it and inked the entire Pogo Sunday Page. Pogo Sunday Page inked with Apple Pencil. I continued inking other Comics as well, because each comics artist inks differently. I inked some panels of Gaston Lagaffe a great comic by Franquin. He used quill pens to ink his comics. He has a much looser ink line. I also took a Mickey Mouse cover by the amazing Dutch comics artist Daan Jippes. His artwork is truly amazing and his inks are on point. I had most difficulty mastering these inks, because they are long and big strokes and very delicate. 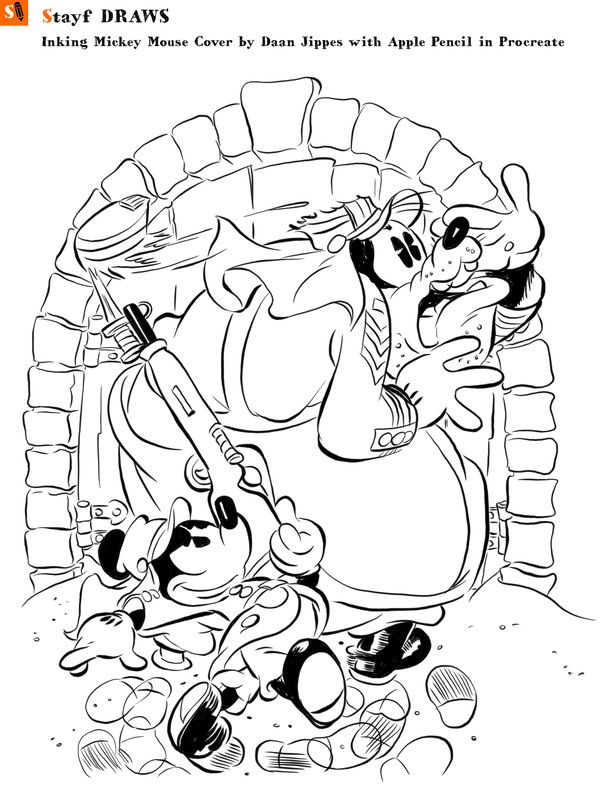 Inking a sketch by Marten Toonder’s Bummel. I found a rare sketch of the great Dutch comic artist Marten Toonder. It is a panel of the daily comic Bummel. As far as I know the panel was never used in the comic strip. I inked over it in the style of Toonder. My conclusion is that you can draw and ink comics with the Apple Pencil in Procreate. Apple has made the best drawing stylus for the iPad Pro. it is very precise and you can ink with it like a pro. You can ink a variety of ink styles with it and the sensitivity comes very close to inking with a brush or real pen. You have better control over your linework. Even better than working with a Wacom Stylus on a Wacom Cintiq.